Mr. Ramu was a very successful professional working in Bangalore. His work was hectic, so he wanted to take a break for 2 weeks. He decided to travel to Kerala for a retreat. He knows that he can find best quality stay in AirBNB and can book the convenient location easily. He logged into the application and finds an irresistible offer - Coconut Grove in Kochi, an ideal guesthouse for his family of 3 people, located amidst the nature. He finishes the booking in 5 minutes including skimming through the 120 reviews which gives overall 5 star rating for the location (Reference link: https://www.airbnb.co.in/rooms/4824719 ). He also contacts the hosts and let them know of his retreat plan and get acquitted with them. Overall, it took him 10 minutes to find an awesome host and place for his vacation. What an incredible experience? In the absence of internet & smartphone, we will have to go through our network to find such a place. It is going to take more time than the overall stay. It is also not going to be such a smooth experience for the options would be limited. It looks scary to even think about it! isn’t it? Rapid advancement in technology in terms of exponentially increasing computational capacity & memory capacity and rapidly shrinking size of the device has made the above experience possible. They are the real crux of Digital Revolution. An estimate says that more than 40% of Indians are connected to internet. Digital Revolution is all about providing Real Time Customer Experience via Interconnected Smart Devices. Amazon, flipkart are examples of Digital Technology in Commerce. 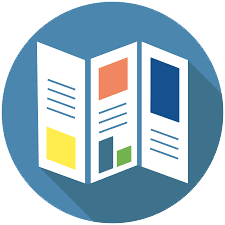 They not only provide the product information, but also user reviews coupled with real time tracking of the ordered goods. They have made sure that customer grievances are handled real-time. What a change over against the retail outlet. We have to physically go there to make the complaint and we would be lucky if the issue is resolved without further visits. A time consuming and frustrating experience! Digital Technology has solved it seamlessly! Watsapp, Facebook has become an important part of our lives in the way we communicate with each other and get updated about the world. 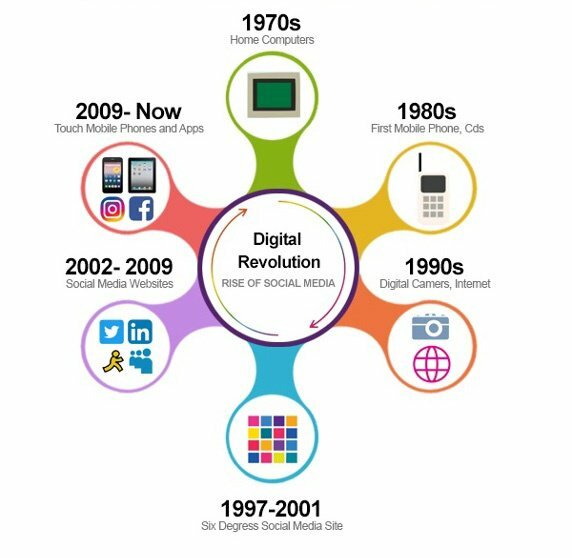 They were possible only due to the advent of digital technology - Internet & Smart devices. They play an irreplaceable role in our lives. Ola, Uber, OYO, Rivigo and more are other examples of digital technologies. Other businesses are adapting to the revolution on an emergency basis, for they have the fear of being left out. 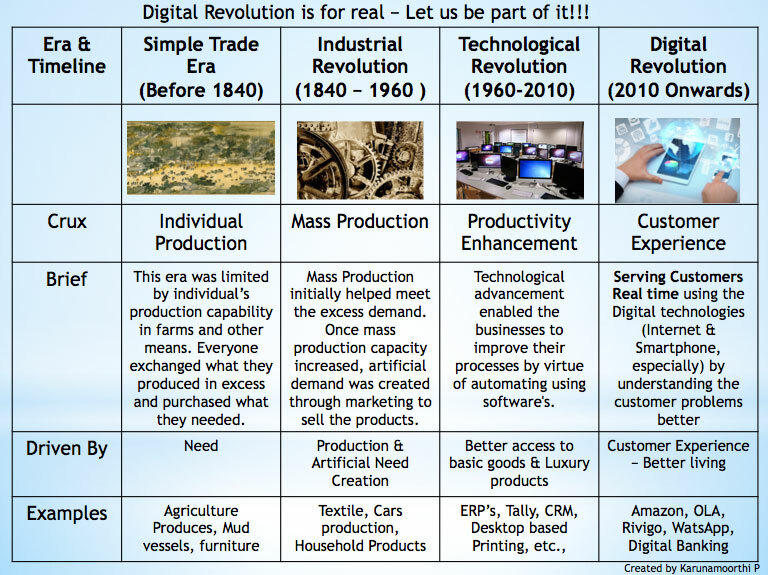 In order to understand the Digital Revolution, we need to understand from the fundamentals. For that Human evolution in itself is important to be understood. As we settled down to form civilisation, we were involved in simple exchange of goods with each other (Simple Trade Era). Then came Industrial Revolution, which automated the mechanical tasks and increased production tremendously (Industrial Revolution Era). Advancements in our understanding of the world has led us to discover Computer and that has let the next revolution in Productive enhancement with the help of automating intellectual tasks using computers (Technology Revolution). Further advancement in Technology and drastic shrinkage of sizes in the devices has let the world to be connected over internet via smart devices. This has let to the current revolution in providing customers with real time product experience and service (Digital Revolution). Digital Revolution is demanding new skills in terms of familiarity with Interconnected Smart Devices. So, they also offer unique and interesting challenges to the business and professionals who is going to be part of it. It is going to be a life transforming revolution as it has the chance to advance the whole of humanity together! Digital Technology is for real and why should we wait to be part of it?